Jailbreaking an iOS device brings a number of well documented advantages to the table. It includes things such as gaining full control over software installations on the device, as well as being able to easily manipulate app file names and strings to change the default behavior, look and feel of how the whole thing works. On the whole, the additional control that jailbreaking gives users can only be a good thing, but with that being said, there are certain pitfalls to be wary of. The ResetAllKiller tweak that has recently landed in Cydia brings one of the possible pitfalls to mass attention and offers a simple, but effective solution against it. When an iOS device is jailbroken, it exists in a delicately balanced and fine-tuned state between operating how Apple intended it to, whilst offering the enhanced control which jailbreaking provides. When new versions of iOS are made available, updating to them will inevitably cause some kind of “sans jailbreak” situation, meaning that users will then step carefully around the Settings app so they don’t accidently do something, well, crazy. ResetAllKiller recognizes that issue, and when installed, it removes access to certain parts of the Settings app to stop users from accidentally – or in some cases purposely – pressing the Reset All Settings button, which resets the device to its stock factory settings. The tweak itself doesn’t offer any additional SpringBoard icons or settings entries, it simply hooks into the existing menu that can be found in Settings >> General >> Reset. After installing ResetAllKiller, you will notice that the reset options are still present in the menu structure but have been grayed out, therefore removing any access to them. 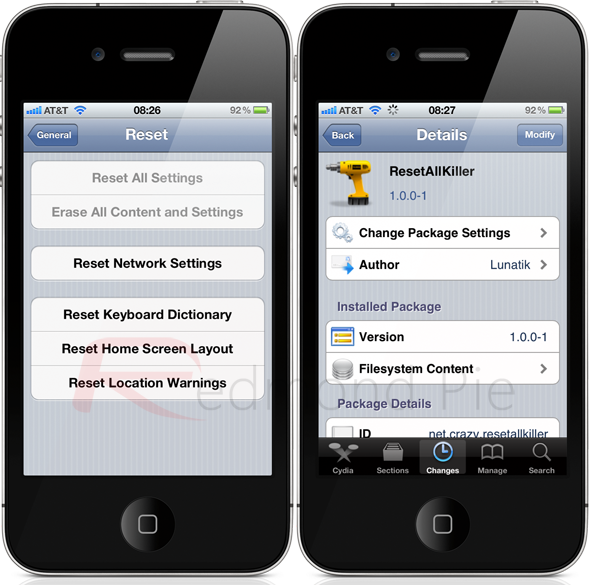 ResetAllKiller is available from the BigBoss repository as a free of charge download and requires a device running iOS 4.0 or above.